Know: The church leaders at Jerusalem confirmed that Gentiles did not have to be circumcised and keep the ceremonial Law of Moses in order to be saved. Think: Live with the understanding that salvation is by grace through faith for all people. Do: Defend the truth of the gospel, opposing those who teach that works are necessary for salvation. Is there a different Gospel for Jews and for Gentiles? B3 What does circumcision have to do with salvation? Sacrifice of the male with the blood from the circumcision accepted in its place. Identification of the male with God. Fulfillment of the covenant, that is, makes them full Jews (without circumcision they are still Jews but not of the covenant). In time of Acts 15 a proselyte was to be baptized and circumcised in order to enter the covenant. Thus some taught that if no circumcision, then no salvation. (2.) it would doubtless be maintained that the religion of the Messiah was only a completing and perfecting of the Jewish religion; that it was designed simply to carry out its principles according to the promises, and not to subvert and destroy anything that had been established by Divine authority. It is usually not difficult to perplex and embarrass young converts with questions of modes, and rites, and forms of religion; and it is not uncommon that a revival is followed by some contention just like this. Opposing sects urge the claims of their peculiar rites, and seek to make proselytes, and introduce contention and strife into an otherwise peaceful and happy Christian community. Compare Genesis 17:14 and Exodus 12:48-49. B4 Name some ways that people attack Christianity and the preaching of the Gospel? B5 How was the Gospel attacked in Acts 15:1-5? B6 Did this situation have legitimate questions and concern? B7 Why was there "sharp dispute and debate?" Is it right for Christians to do this? The greatest words in this passage are "... for he purified their hearts by faith." What was Peter referring to when he said, "God, who knows the heart, showed that he accepted them by giving the Holy Spirit to them, just as he did to us?" Why is the Gospel ONLY by grace alone through faith alone in Jesus Christ alone? What is wrong with our "good works?" Why don't our good works help us into heaven? See Ephesians 2:8, Galatians 2:16, and Isaiah 64:6. Name some ways groups and people teach are necessary in order to be saved? Brian Williams, a pastor living in Buffalo, NY area, writes, "Peter was very deliberate in his speech to make it clear that this evangelism of the Gentiles was the work of God and not man. According to Peter, God made a choice (Acts 15:7), God knows the human heart (Acts 15:8), God cleansed their hearts (Acts 15:8), and God made no distinction between them and Jewish believers (Acts 15:9). The implication is that the Gentiles had been saved by faith alone, apart from being circumcised. Any attempt then at requiring the Gentiles to be circumcised would have two results. First, they would be testing or provoking God, and second, they would be putting on the followers of Christ an unbearable yoke (Acts 15:10). As the Jews typically viewed themselves as being the original recipients of God's favor, Peter turned this around in verse 11 (Acts 15:11) by stating that they (the Jews) would be saved by grace alone, just as the Gentiles were." What are the things that Gentiles who believe are NOT to do, and what are they to do? Do these 4 things have any authority for today's believers? Give some examples of application for these 4 rules. B10 Acts 15:22-29 speaks of the decision to write a letter and who will deliver it to the Gentiles in Antioch. It also is the letter itself. B11 Acts 15:30-35, what was the response of the believers in Antioch? 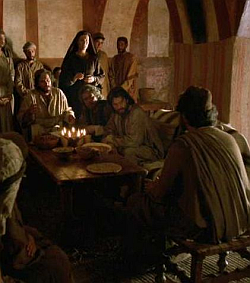 B12 Acts 15:36-41 speak of the disagreement between Paul and Barnabas concerning John Mark. B13 Give some examples of false gospels you have heard preached at funerals, meetings, TELevangelists, on the radio, read, etc. B14 How would we tell these people the truth? Will we be believed? B15 How to we deal with false converts? B16 Is it worth disagreeing with people over what the Gospel is or is not? B17 What are some things (doctrinally) that we cannot compromise? B18 What are some things (practically or culturally) that we can allow differences? What are the qualifications of a false prophet?